Sigma has renamed its flagship digital SLR camera, the SD1, to the Sigma SD1 Merrill' which is in honour of Richard Merrill, inventor of the Foveon sensor technology on which the SD1 is based. 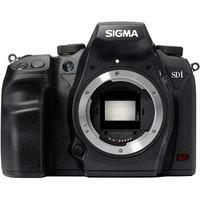 The Sigma SD1 Merrill includes the same features, performance, and specifications as the original Sigma SD1, however, the price is substantially revised. The revolutionary image capture system features a 46 megapixel Foveon X3-type image sensor to ensure outstanding resolution and natural rendering with rich gradation as well as a three dimensional feel. The Dual True II image processing engine and DDR buffer work together for high speed processing of images without lowering the quality. The SD1 Merrill adopts a lightweight yet solid magnesium alloy body along with buttons and connected parts sealed with O-rings, enhancing durability as well as preventing dust and water from getting inside the camera.